Philippa Langley, is the secretary of the Scottish Branch of the Richard III Society. The live broadcast on Channel four started at 10 am and was presented by Jon Snow. The body of the dead king was buried in the Choir of the Priory church of the Gray Friars in 1485. This was done in a hurry as the victor, king Henry, was anxious to leave Leicester and be on his way to London as quickly as possible. The king would have had a simple but brief ceremony of rights for the burial of the dead but that would have not been different from anyone else who was being laid to rest. There was no elaborate service for the burial of a king there in Leicester in 1485. 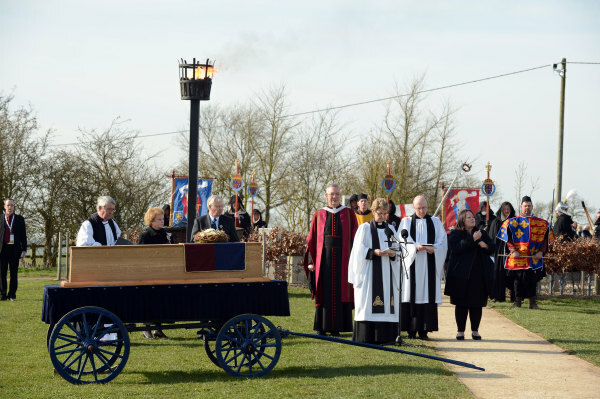 Today’s event was a way of rectifying the short-comings of the medieval interment by finally laying his remains to rest with honour and dignity. Because Richard was a catholic, a rosary was placed in his coffin by historian John Ashdown-Hill. Today’s guests reflected the complex protocols of status and hierarchy that are used to decide who should be invited to either attend or take part in a church service of this kind. The reinterment of a monarch has not taken place in living memory and the last royal public funeral was that of the Queen Mother in 2002. The funeral of Diana, the Princess of Wales, took place in 1997 but that was not a state funeral. It was a royal ceremonial funeral. Leaders from many of the faiths represented in Leicester’s diverse community were present in the congregation. The service represented a confluence of the mediaeval and the modern. I noticed the new Cathedra – the throne of the Bishop of Leicester. The multi-coloured chair – looking like something that had just been delivered from Ikea – contrasted sharply with the more traditional wooden seats occupied by other members of the clergy. Richard’s coffin was lowered into a tomb in the choir of the cathedral, to the left of the high alter. The king was placed in the choir of the church of the Grey Friars priory in 1485 during his hasty burial. The choir is one of the holiest and most scared parts of both Anglican and Catholic churches. In the churches and monasteries of mediaeval times, burial in the choir would have been reserved only for those of the high rank and status. Later today, the grave will be sealed with the tombstone made from Swaledale fossil stone, quarried in North Yorkshire. It was chosen not only because it will polish to a fine finish, but also because the fossils within it are long dead creatures immortalised now in stone. It will sit on a plinth of dark Kilkenny marble on which the king’s name is carved. King Richard III’s tomb has been designed by the architects van Heningen and Haward. Over twenty thousand people came to see the king’s coffin while it lay in repose at the Cathedral. Many of those involved in the discovery of the king’s remains and in the research carried out on them were surprised at the size of the public response. People had journeyed to Leicester from all parts of the globe to be present in the city and to witness this internationally reported event. 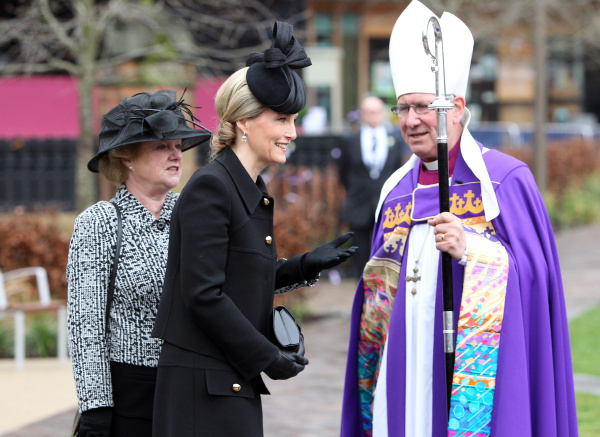 Prince Richard, Duke of Gloucester, cousin of Queen Elizabeth II and his wife Sophie, Countess of Wessex (who today represented our current Queen) were the principal royal family guests at the ceremony in Leicester cathedral. 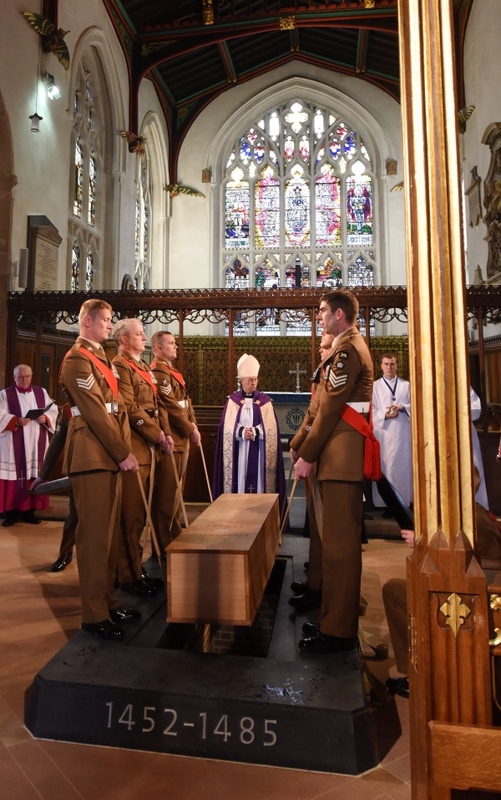 Also in the congregation was the Earl of Derby, who also appeared in the Channel 4 programme broadcast live as the service happened. The Queen was presented by her relative the Countess of Wessex but protocol did not allow her to attend in person. The guest list would have been governed by traditions going back a long way in time. Even though Richard’s death took place 500 years ago, his descendants were present at his reinterment. Michael Ibsen and Wendy Duldig were descended from Richard’s sister, Anne; their blood line was researched by the team at the University of Leicester in order to match their mitochondrial DNA with that taken from the bones of the king. They will meet, with members of the families directly related to Richard (the Somersets, Ibsens and Wendy Duldig) and many are distant cousins, separated by generations. 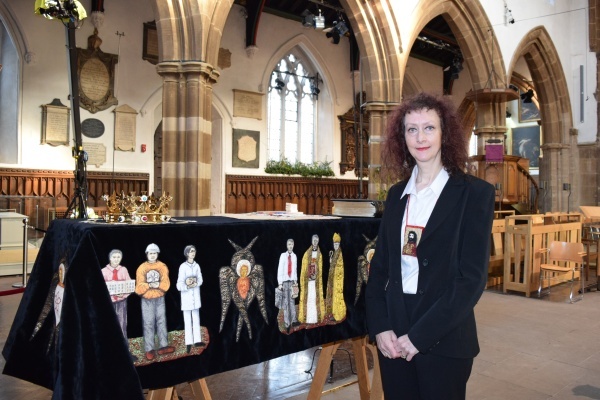 Direct descendants of Richard III attended the service. Descendants of others who fought at the battle of Bosworth were also there, including some of those who trace their ancestry back to the key leaders of Richard’s allies and also to those from the Lancastrian camp. Those who can trace their ancestry back to Richard and people alive in his time included TV presenters Jon Snow and Peter Snow and actor Dominic Cumberbatch. It was pointed out, during the TV broadcast that the Plantaganets married English people rather than continental royals. For this reason, many people alive today can trace their ancestors back to his period of the middle ages. 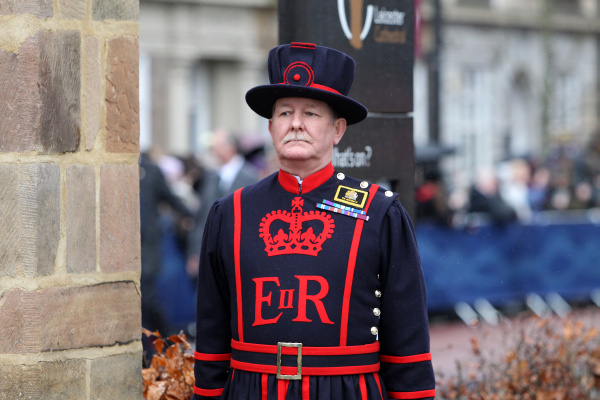 The crown placed on the coffin of the king was commissioned by John Ashdown-Hill. It was a replica of the crown that Richard wore at the Battle of Bosworth, which was, after his death, placed on the head of the victor Henry Tudor as he was proclaimed king, at Bosworth Field. According to the Royal Shakespeare Company, we owe it to Shakespeare for writing the play about Richard III. Had he not done this, the king might have been forgotten and might not be here today. Historians argued over the pros and cons of the Tudor representation of Richard and the extent to which the recent discoveries had changed the history books. The reinterment of monarchs was common in mediaeval times. Today’s service was based on a document, found in the British Library, of a service carried out at the time of Richard III. The Earl of Derby was interviewed by Jon Snow. 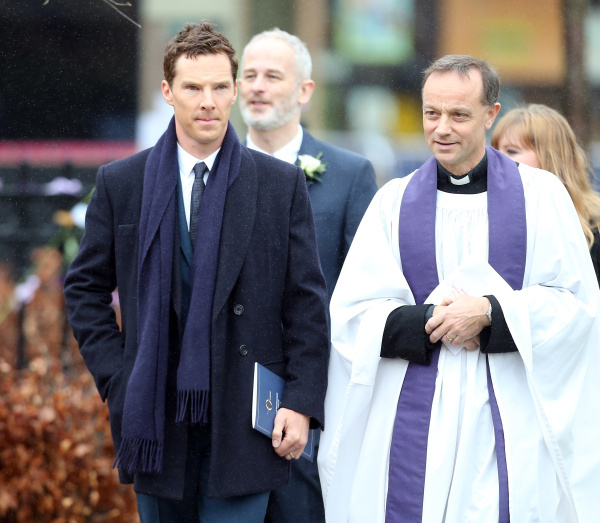 Actor Dominic Cumberbatch (38) read a poem written by poet laureate Carol Anne Duffy, as part of the service. Three actors, who had taken on the role of the king in plays, were present including Robert Lindsay. Asked if he would play Richard again, Lindsay replied that he was now old to do it (he is 65 and Richard was 33 when he was killed.) The Actor will be playing Richard lll in the BBC series The Hollow Crown: The Wars of the Roses. 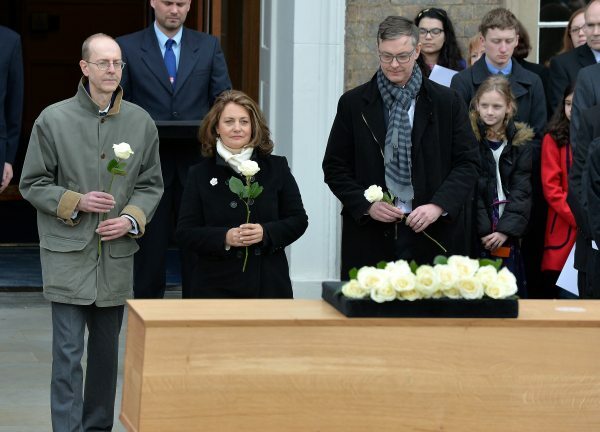 The coffin in which the king was interred was made by his descendant Michael Ibsen, a Canadian-born cabinet maker now living in London. Researchers at the University of Leicester traced his ancestry back to the sister of Richard III, Anne of York and mitochondrial DNA from Michael Ibsen and Wendy Duldig was used to confirm that the bones found in the car park were in fact those of the king. Wood used by Ibsen to make the coffin was sourced from the Duchy of Cornwall. Ibsen designed the coffin to be very plain in style because, he thought, had Richard been placed in one in 1485, it would have been a very plain construction. Michael Ibsen also designed and made the box in which three samples of soil were placed, from three key places of the king’s life – Fotheringhey, where he was born, Middleham, where Richard met his future wife Anne and Bosworth where he was killed. 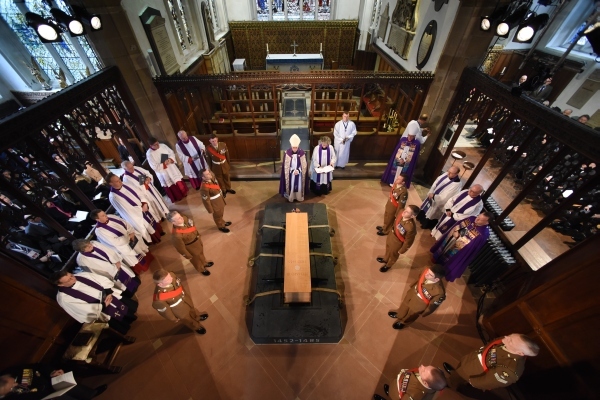 The soils were scattered onto the coffin by the Archbishop of Canterbury, once it had been lowered into the tomb. The preparation of the service and the way in which it was conducted, represented a collaboration between the Anglican and Roman Catholic churches. Some commentators went so far as to suggest that the service represented in part a reconciliation of the Churches of England and Rome. Leaders of Leicester’s many faith communities were present at the service. 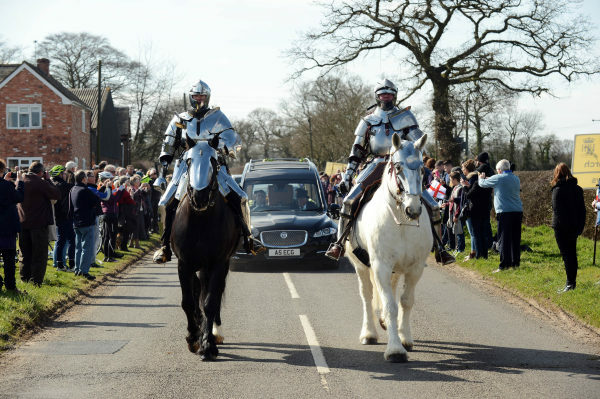 During the delivery of Richard’s coffin to the Cathedral, the procession was led by two horses mounted by knights in full mediaeval armour. In an earlier channel 4 programme about Richard, Dominic Smee, who also had the spinal condition adolescent-onset scoliosis which was indicated in the king’s skeletal remains. The programme, broadcast in August 2014, showed Smee being fitted with a tailor-made suit of armour. He took part in a series of exercises on horse back, including a cavalry charge. This suggested that the king’s condition would have been well hidden by his armour and that it need not have had any great effect on his ability to fight in battle. The financial value from the discovery and interment of King Richard was estimated to be some £50 million to the city and county between his remains being discovered in 2012 up to the present re-interment at Leicester Cathedral. In 2013, the City of Leicester failed in its big to become the City of Culture 2017, a prize that would have been worth £15 to £18 million. According to the BBC, Liverpool’s year as European Capital of Culture boosted the regional economy by £800m, attracting millions of new visitors to the city, figures showed. What was the impact of the service? 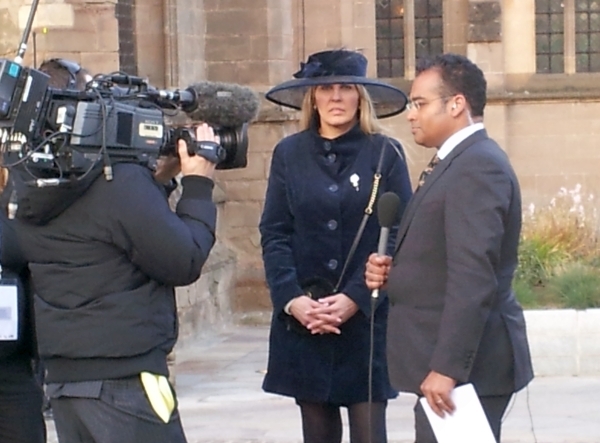 Philippa Langley said, towards the end of the channel 4 broadcast, that the service had been emotional. “It represented the end of a journey”, she told Krishnan Guru-Murphie. Asked if the crowds would keep coming back to Leicester, Philippa believed that they would. Both the discovery of the bones and now their reinterment had stimulated public interest in Richard and in the history of the middle ages. John Ashdown-Hill complained, in his interview, that the Eulogy had got the wrong month for Richard’s birth; it was October, not May, he claimed. One thing that stood out in the service was that we were witnessing the re-burial of a human being, a person, an individual and the prayers were for his soul as a man, as much as for him as a king of England. During Jon Snow’s presentation, from the commentary box overlooking the Cathedral’s south courtyard, the reconstructed head of the dead king was placed on the table in front of the chairs where the interviewees were seated. The whole period, between the discovery of his body and his laying to rest today, has brought him into peoples’ consciousness as a man; we have got to know him, more so than with any other monarch from the middle ages with the possible exception of Henry VIII. TV has played a key role in bringing history to life in the popular imagination, through programmes such as The Tudors and Wolfe Hall. There have been many reconstructions of heads and faces from skulls that have been dug up and a bevy of scientists have emerged, skilled in this kind of procedure. Facial reconstructions have been seen before on programmes such as Time Team. What has the week been like? As a resident of Leicester, I have followed the events closely, either being present at some of them myself or watching as they were broadcast on the television news programmes and reported in the press. I decided today to watch the whole of the live broadcast, by Channel 4, of the service at the cathedral (I did not get a ticket in the public ballot) rather than going there to cover the event from outside with the general public. Seeing Leicester become the focus of the world media this week gave me a sense of pride both as a resident of the city and as a journalist. Yesterday and today, the world news was somewhat eclipsed by the tragic crash of the Germanwings plane in the French Alps. All the media was a captivated by the re-interment just as the public were. My week was dominated by attending events and press conferences, writing new stories and articles and by delving deeper into the history of the king and his times. Being someone who has a passion for both history and for news, this was an exciting and commanding week. I kept hearing references to Richard III being “England’s most controversial King.” This annoyed me; all of the mediaeval monarchs were controversial, for one reason or another. In fact, I cannot think of an English monarch at any time in history around whom controversy has not been waged, right up the present day. At the time of the death and funeral of Diana, Princess of Wales, there was controversy about the present Queen and her failure to respond to what was happening in London. If we consider Henry VIII’s activities, whilst king of England, there is surely more there than we could lay at Richard’s feet. It is a question of degree; it is all relative. Channel 4 often referred to the death of the princes in the tower, during the programme today and during previous broadcasts, as though this was the defining issue that sticks to Richard. Admittedly, they also pulled in pro-Richard comments about his good and positive achievements, from commentators who offered a balanced viewpoint. Seeking to highlight the many myths surrounding Richard is as much modern media spin as that pumped out by the Tudor propagandists. One factor that contributed to the public attendance was the weather. On Sunday, the sun was shining all day and the brilliance of a spring day helped to bring people into the streets in their thousands, all over the city and county. Today, the guests arrived at the Cathedral on an overcast morning, slight rain bringing out umbrellas but towards the conclusion of the event, the sun came out and the sky cleared.